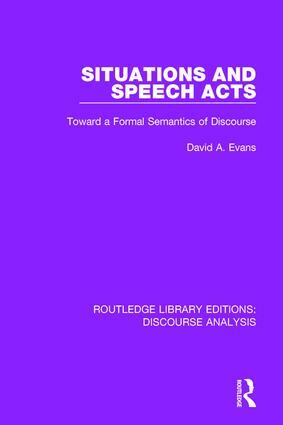 First published in 1985, this book aims to develop an approach to speech acts that has the virtue of being straight-forward, explicit, formal and flexible enough to accommodate many of the more general problems of interactive verbal communication. The first chapter introduces situation semantics with the second addressing the assumptions implied by the problem of representing speaker intentionality. The third chapter presents a streamlined theory of speech acts and the fourth tests the predictions of the theory in several hypothetical discourse situations. A summary and suggestions for further research is provided in chapter five, and appendices facilitate reference to key concepts.